A Le Fort I osteotomy with maxillary advancement can be used to correct Class III malocclusion that is related to congenital or developmental maxillary hypoplasia. A Le Fort I osteotomy combined with distraction osteogenesis is a powerful technique that can be used to treat the most severe forms of maxillary hypoplasia . It also offers the benefits of functional airway improvement. Le Fort I distraction advancement may improve obstructive sleep apnea or aid in the removal of a long-standing tracheostomy [2, 3]. It is a technique that may be performed before skeletal maturity or during childhood, after the maxillary canines have erupted. Traditional acute Le Fort I advancement is usually performed after skeletal maturity . Performing a Le Fort I distraction can correct a child’s facial deformity and may be important for his/her psychological well-being and self-confidence. Following a Le Fort I distraction during childhood, the subsequent need for a Le Fort I advancement at skeletal maturity may often be avoided. The importance of orthodontic involvement and preciese treatment planning cannot be overemphasized. 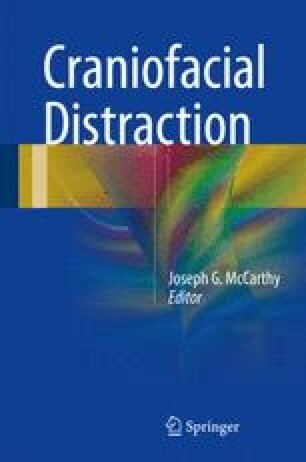 This chapter will document the indications, techniques, instrumentation, and postoperative care involved with Le Fort I distraction.